Well guys! Its time for some for Scandinavian Christmas ideas! 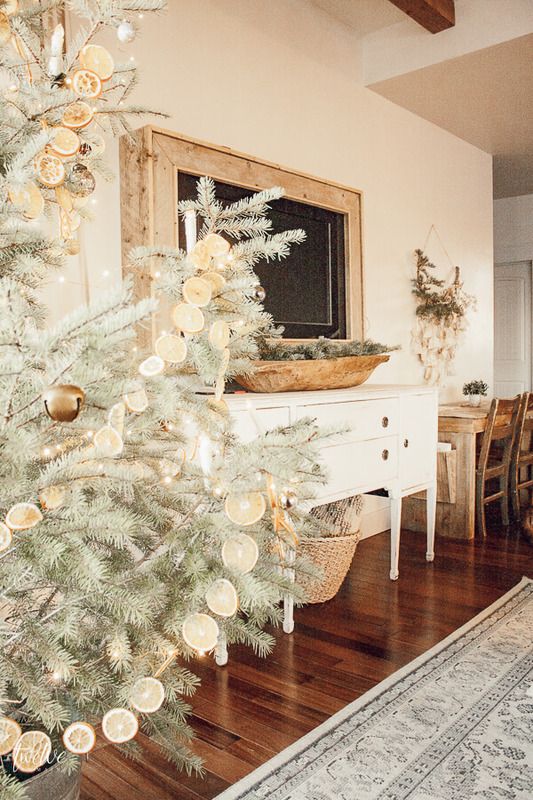 Today I am showing you most of the main floor of my home, and its all decked out for Christmas! Keep on scrolling to see it all! 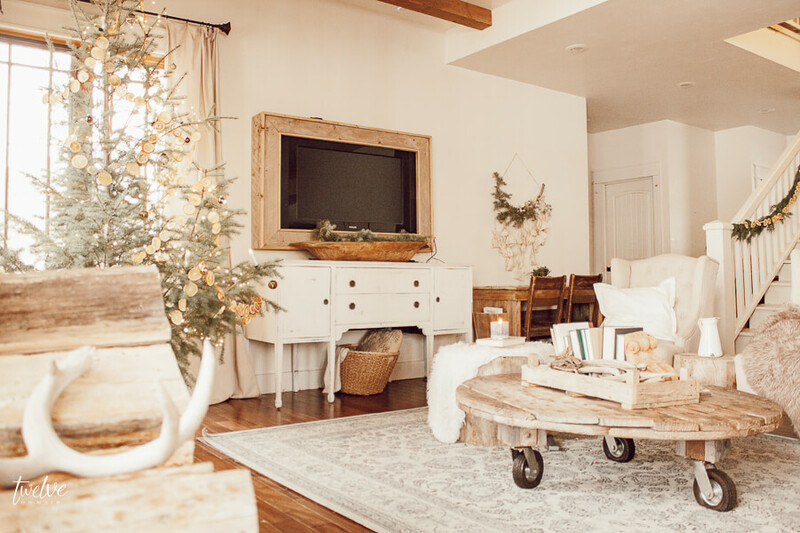 I am so excited to be here today to be collaborating with a ton of amazing bloggers for my third home tour of the 2018 Christmas season. 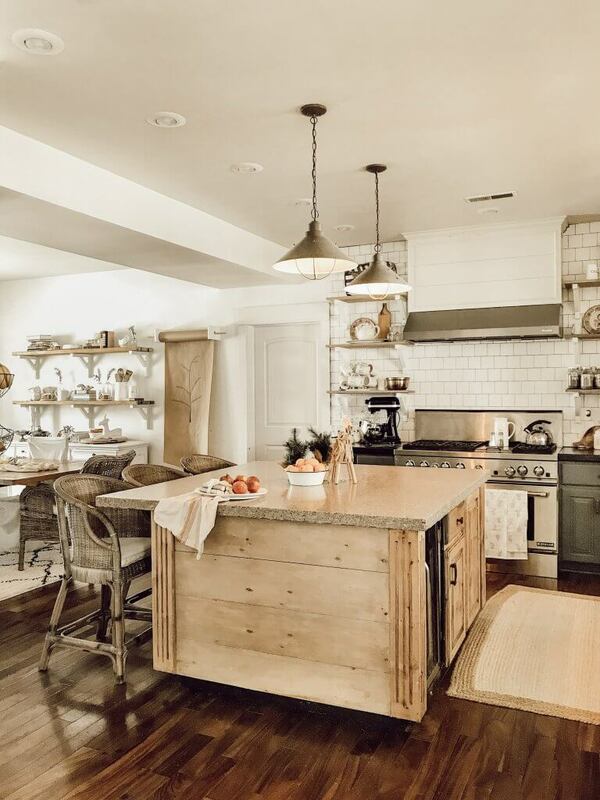 Make sure to scroll to the bottom to see who else is participating in the 2018 Tour of Homes! 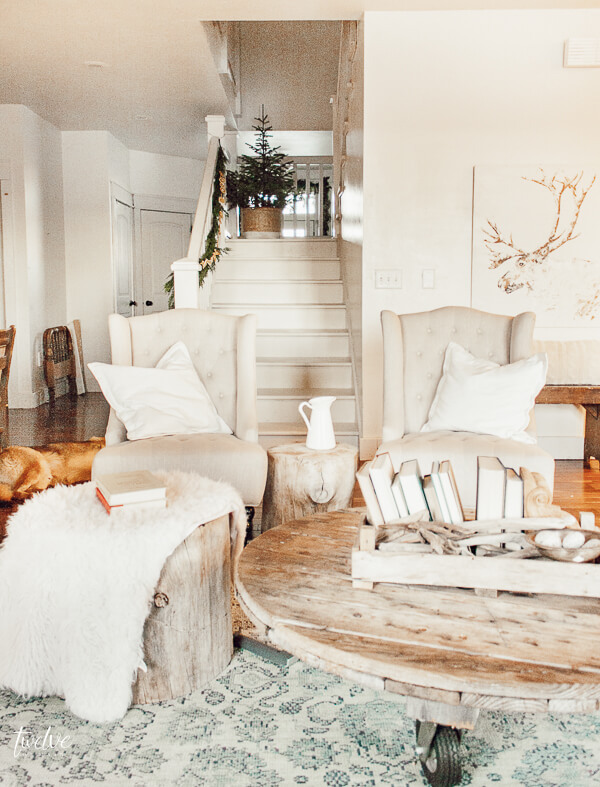 Today, I want to focus on how I added Scandinavian inspired decor to my home in hopes of creating a calming and inviting space for the holidays. Everything about Scandinavian decor inspires me. 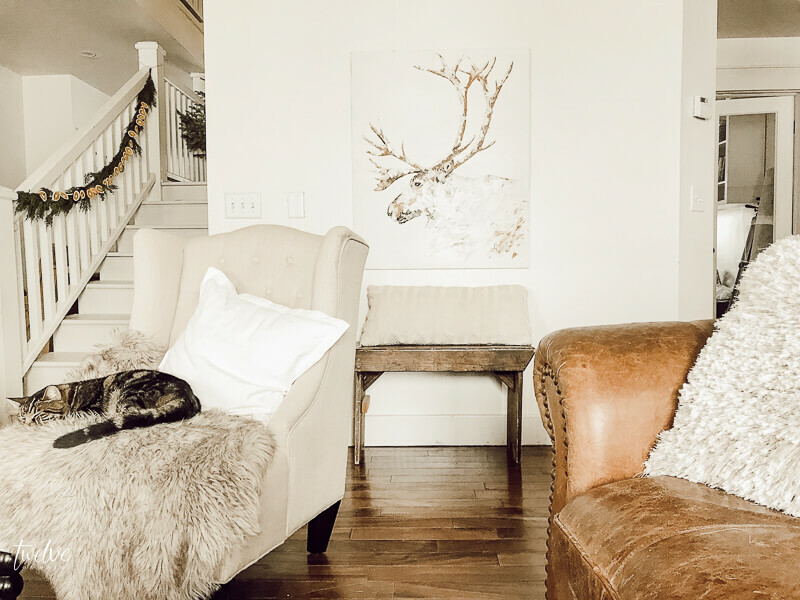 There are so many elements of Scandi decor that you can incorporate into your home if you desire this same look. 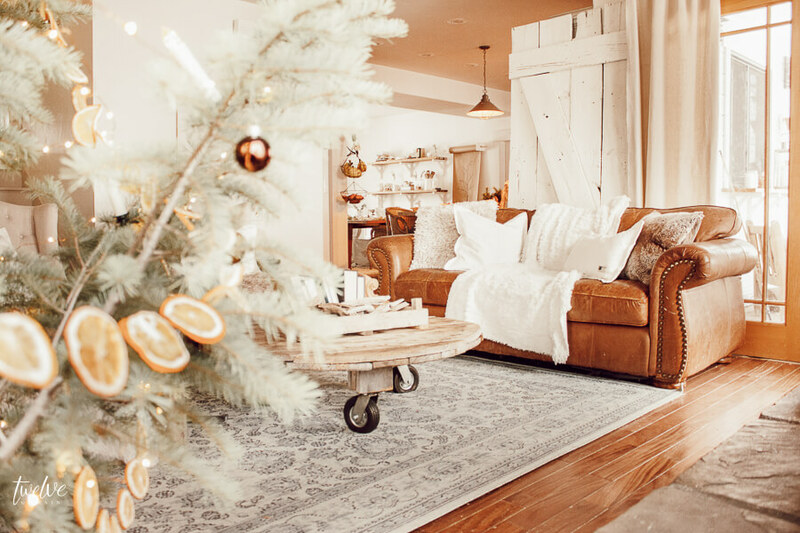 So, this list may seem daunting but, I promise, if you were wanting to incorporate any of these elements into your Christmas decor you are guaranteed to fall in love with it. 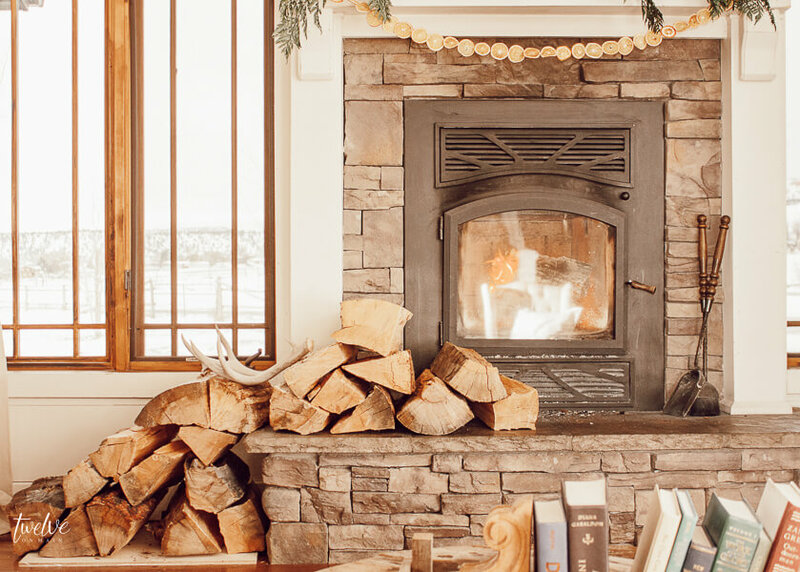 Plus, in all reality, you have everything in your own home to decorate like this already! 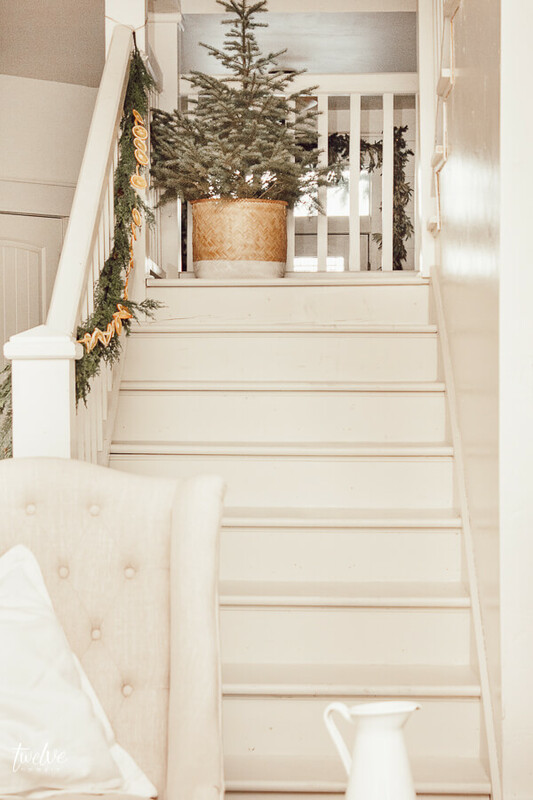 If you want to see the beginnings of my Scandinavian Christmas home tours, you can see my Scandinavian Christmas mantel here, my dining room here, and my porch and entryway here. 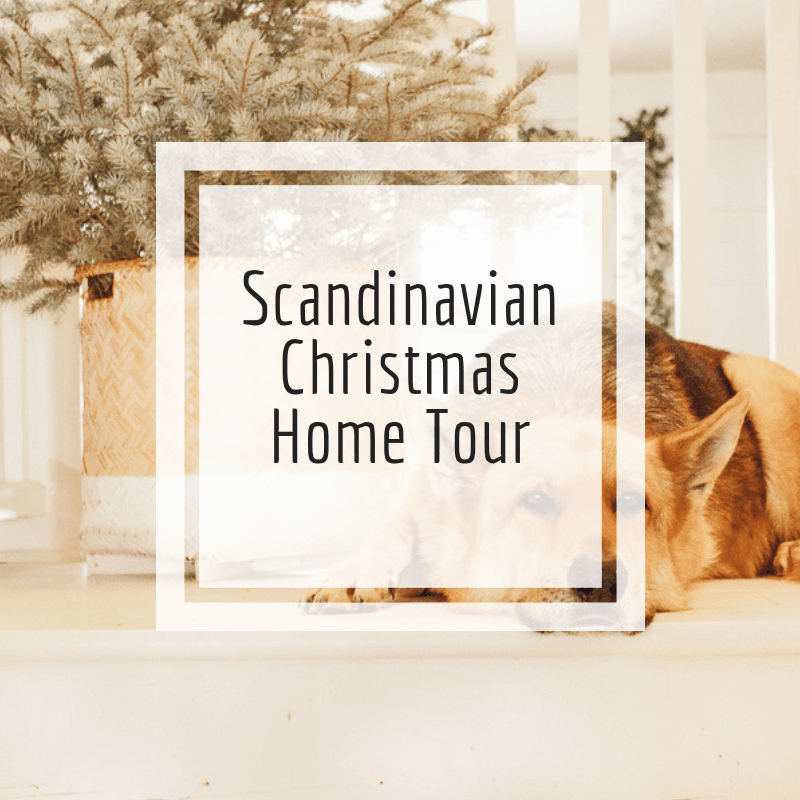 And no worries, there are going to be so many fun images in this blog post, you’ll have a Scandinavian Chrsitmas overload! 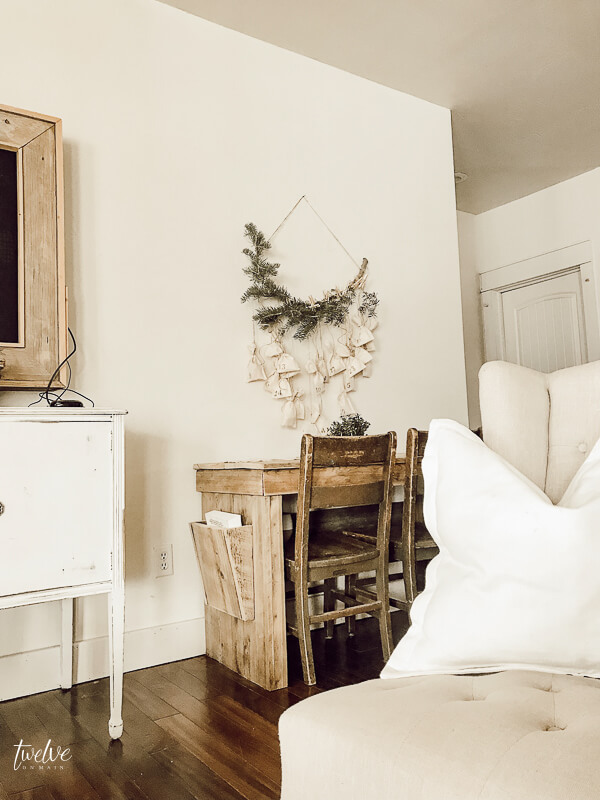 Lets talk about my living room…. I wanted to create a space where we could enjoy the holiday season. With so many family get together’s and friend parties, I wanted to keep the space open, and not overstuffed. I wanted space, and I wanted more of a minimal look compared to what I usually do. Every year we head out to the forest about 5 minutes from our home and find ourselves a Christmas tree. This is one thing I feel incredible blessed to do. It is such a fun experience, even those days when I fall down a hill and hurt myself..(lets pretend that didn’t happen). I usually look for a full, and perfect tree. This year I really wanted to step away from that. We needed a bit of a Charlie Brown Christmas tree, just my own interpretation of one. This tree is imperfect, and its perfect for us. I decorated our Christmas tree this year very simply. I used dried orange garland, some copper twinkle lights, and a few small glass metallic ornaments and bells. Now, I wanted to take a minute to talk about my pictures in this post. I am going to go off on a tangent for a minute. My sweet friend Liz Marie from Liz Marie Blog has the most amazing pictures. She is as sweet as they come and I am in love with everything she does. (I know, sounds pretty stalkery huh?) Recently, she has created some Lightroom Presets, to use in the editing software Lightroom, that I use to edit my photos. What’s even better is that she is raising money to give back to families that are trying to adopt. I think this is such an incredible thing to do. If you don’t know much about her, you need to go read her journey and why this is important to her. So, I decided to purchase some of her presets and try them out today and oh boy! I am totally obsessed with them and may be using them exclusively! I mean come on. The moody and warm tones of the images are exactly what I was looking at creating. Thanks Liz! Now, lets get back to the home tour. My living room has actually been moved around more times than I can count over the past week. I was really struggling with it feeling “right”. 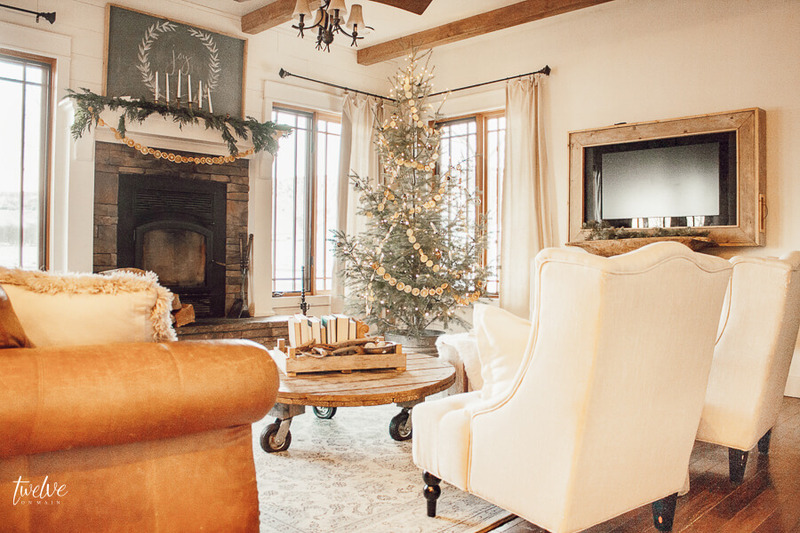 Sometimes, you have to rearrange the space and adding a Christmas tree to a room totally throws it all off. But, I think I finally got it right. The fire is hot, there are ashes on the fireplace, and as usual, the fireplace tools as well. It is how life is here these days. It reality. It snowed a few days ago, and you can just see it outside the windows. See that glow from the fireplace? I spent my whole day here today. I could not get off the couch even my someone paid me to. In my defense, I got up at 5, did my exercises, cleaned out a closet, cleaned up dog poop, made lunches and got the kids off to school. So, I needed a bit of a rest. And this is where I rested. I mean, could it get any better? I kept incorporated a lot of white into my decor this year. I also wanted to add furs and textures. 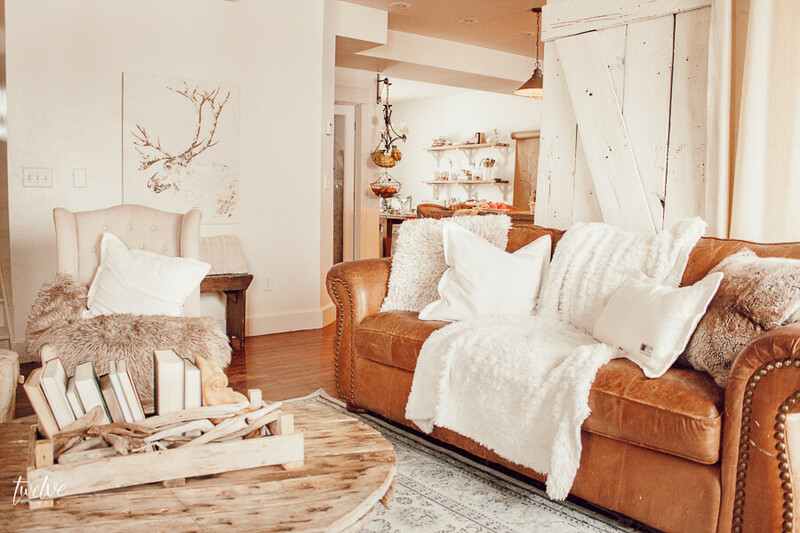 Fur pillows as well as throws were used in this space. But, lets see how it turned out! DO you see it? Its over there in the back above the desk. My kids are loving this advent calendar. We were a few days behind but we have caught up! We had to do gingerbread houses, watch The Elf, and write our Santa letters all in one night, but now we are good to go. 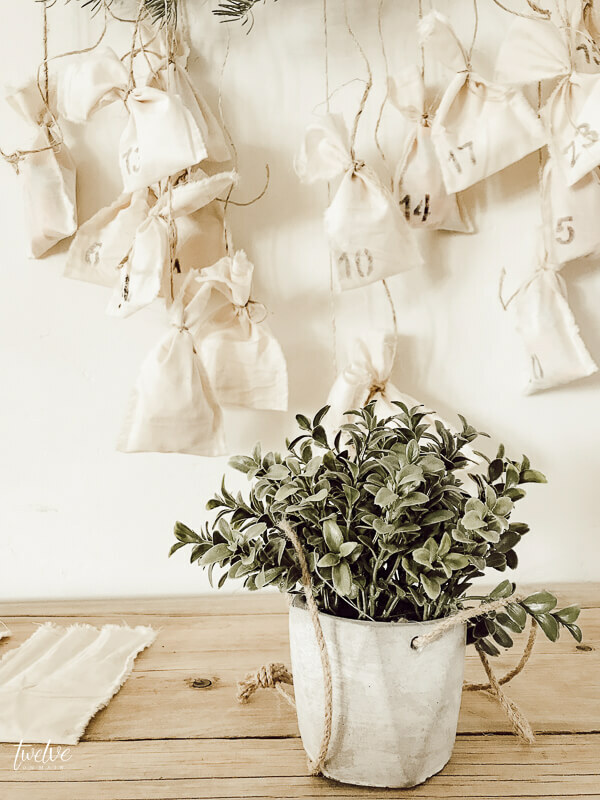 I have some other cute advent calendar ideas if you are looking for one to do in a pinch. Just click here. One thing I haven’t ever shown off in a home tour of mine is my stairs…mainly because they aren’t quite finished. But I had a vision and I wanted to show them off. And as I post this, I see my dog sleeping over in the far left corner of this picture. Haha! I can’t catch a break! Well, this is life! I mean, yes? I am in love with them. And let me tell you, these stairs are far easier to clean than my carpeted stairs before! Having a dog and kids made the stairs so difficult to vacuum and now it is so easy! 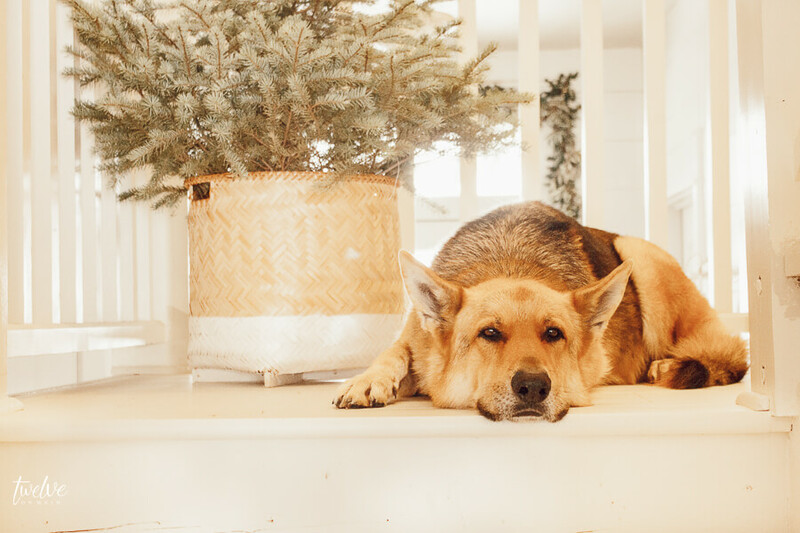 And of course….this is my pups favorite place to hang out. He can monitor whats going on upstairs and downstairs. All his bases are covered. He’s just the best dog…and isn’t he pretty? There are animals everywhere. Fatty McGee our kitty practically melts into the fur throw. I have kept things really simple in the kitchen, and thought I should add a photo of two with that space. Oranges lemons and pomegranates for the win. Simple edible decor. And the dining room is more of the same! 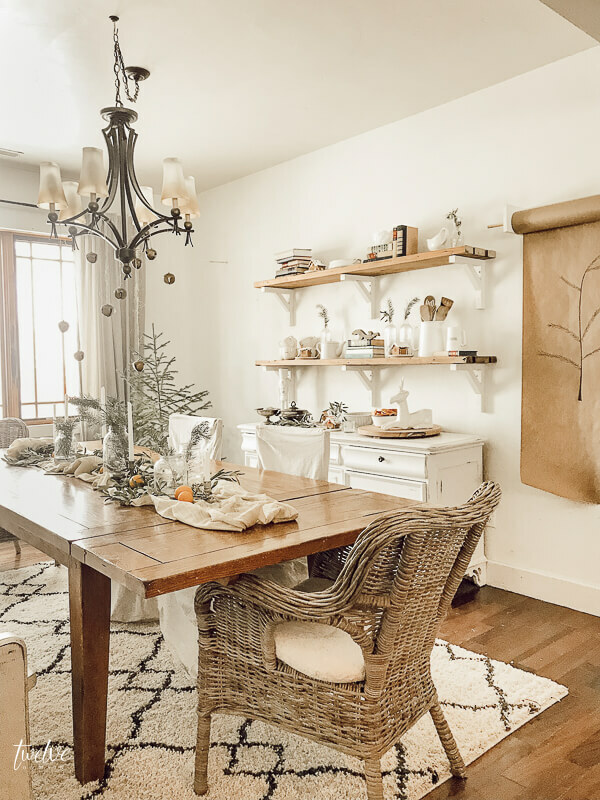 I featured more of it in my Scandinavian dining room in my post about my Christmas tablescape. And last but certainly not least, I wanted to share a bit of the human side of my dining room. I have this huge green vintage chalkboard above our dining table. My daughter loves to draw on it, and I caught her sneaking in to add her own Christmas scene. So, like a good mom, I kept it! Nothing better than a good Christmas scene! And that my dear friends is the end of my Scandinavian Christmas home tour! Be sure to stay tuned this week for new recipes, and more Christmas decor in the bedrooms! I think that its time for me to go watch a few more episodes of The Great British Baking Show and decompress! Now you’ve done it! 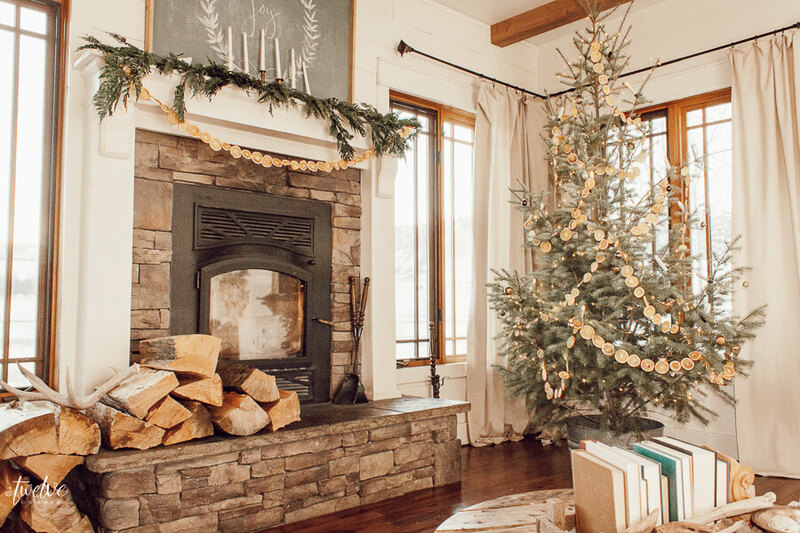 I totally want to make a tree like yours especially with that fab dried orange garland. Love the entire space you’ve create here. Pinned the tree and the living room photos. Thanks so much for sharing with us. 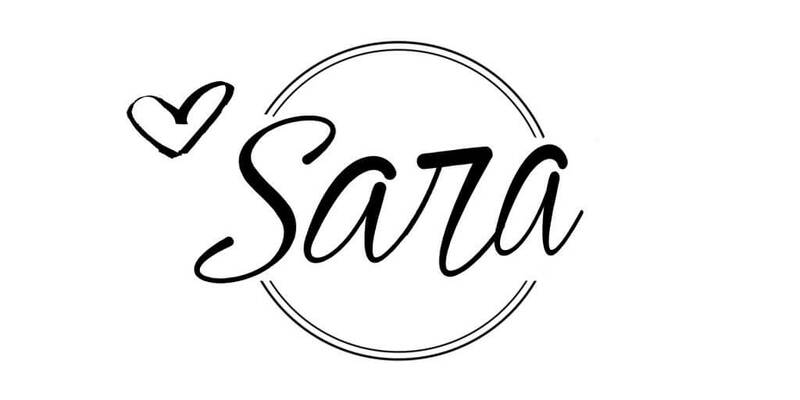 Sara, I think your imperfect tree is absolutely perfect too! That tree was the first thing that caught my eye. 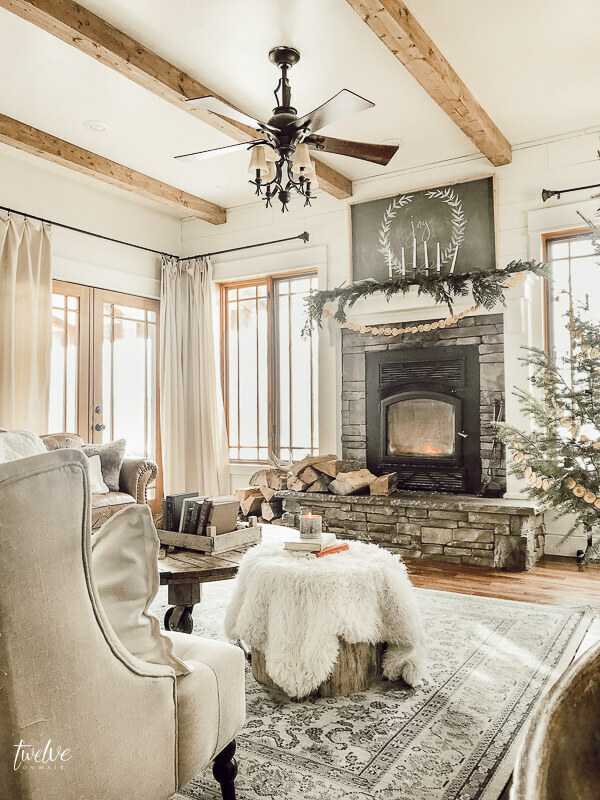 Your entire home is decorated so beautifully and I am so glad that you joined us on this Christmas Tour of Homes 2018. You helped make it a success! I love your style and this gorgeous tour! Your advent calendar is amazing!! SO inspiring! What a wonderful home tour for Christmas. I love the scandinavian style, it is just so pretty. 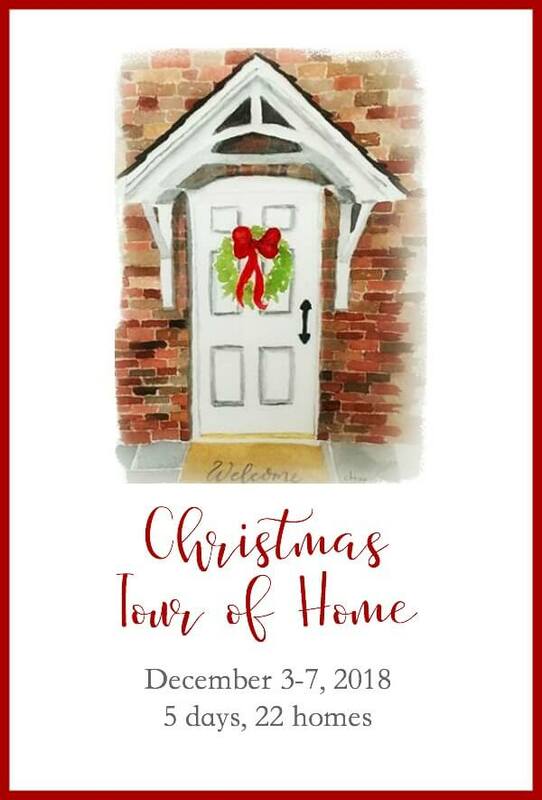 Thanks you for joining us this year for the Christmas Tour of Homes! I love the tree filled with dried orange slices. It truly looks scandi. Your home is just beautiful. Its one of my favorites. 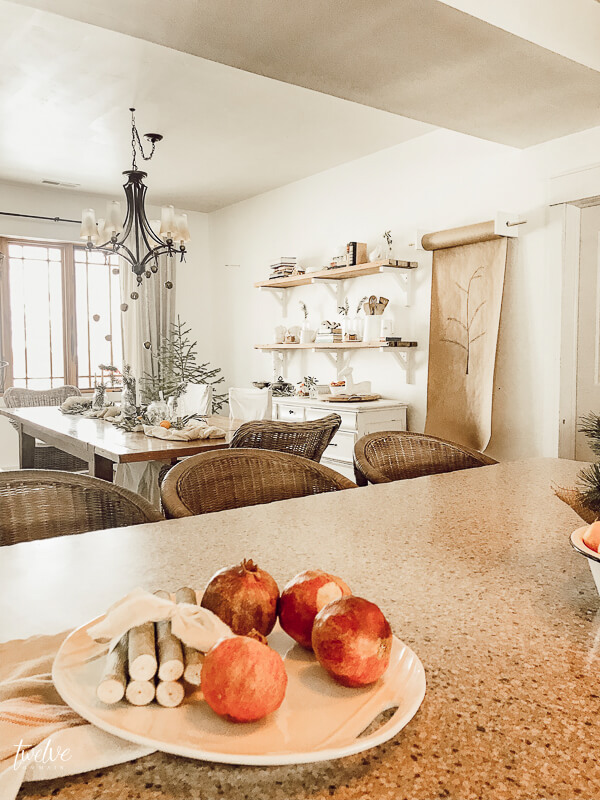 Sara, I just love your house and the simplicity of Christmas in it! I’m so glad you joined us again, for this year’s tour! FYI, I live only minutes from The Found Cottage, which is partly owned by Liz Marie. 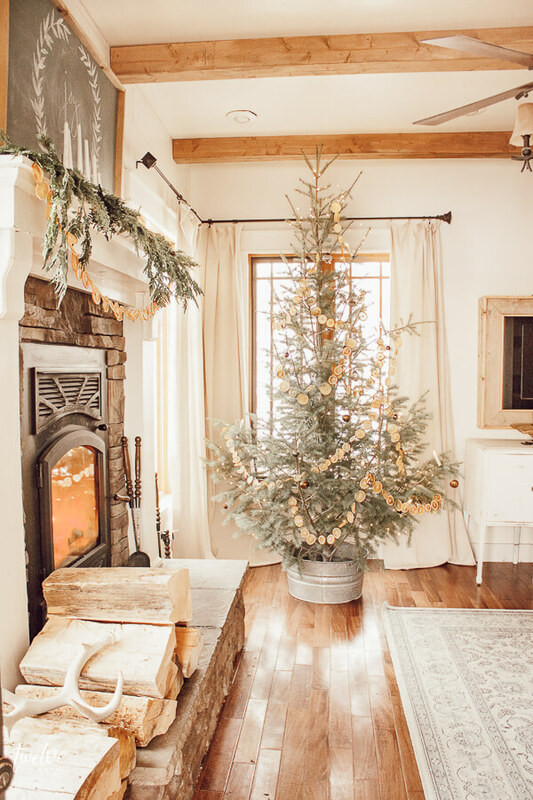 What a fresh take on Christmas decor! 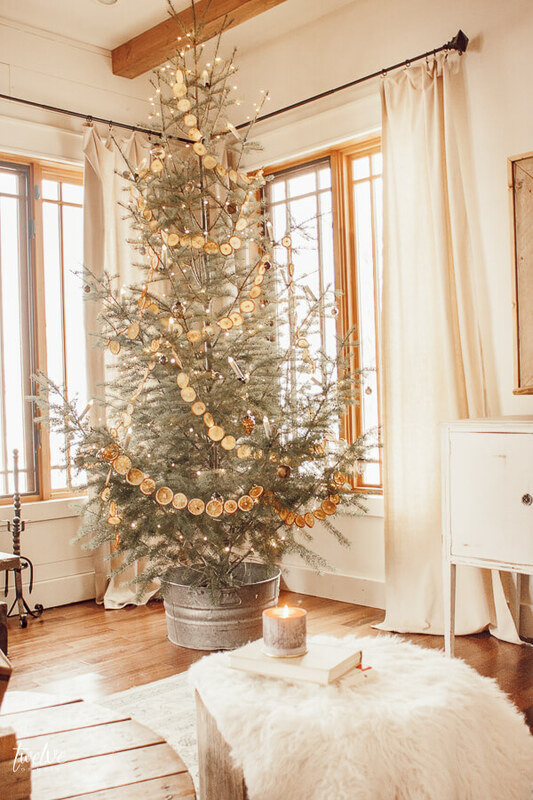 I love the neutral color palette and the orange garland on your tree. The thought of walking through a local forest to find a Christmas tree is so romantic. 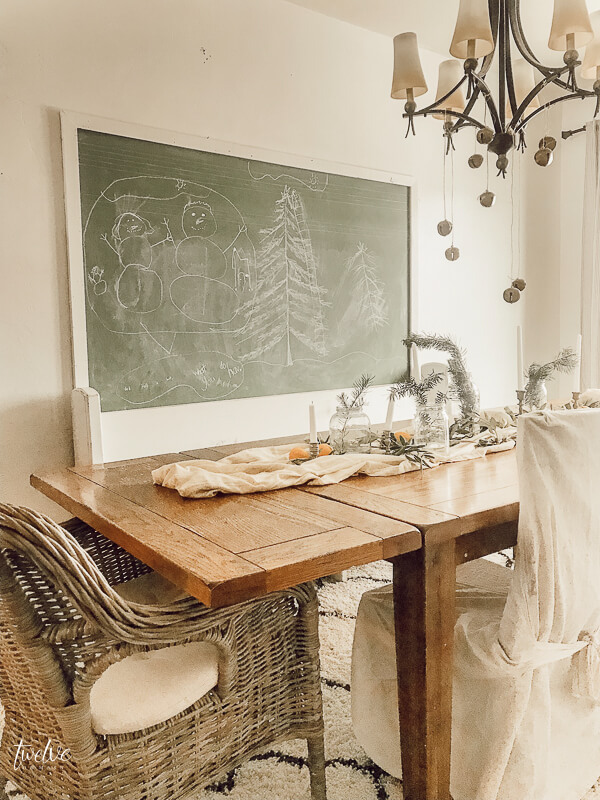 Your dining room is also very beautiful, and I especially appreciate your “real life” moment with the chalkboard. I watched one of your videos painting, and you are such a talent. I’m glad I had a chance to meet you on this blog hop. Happy Holidays! Every single nook and cranny of your hoe is simply gorgeous. I love everything you did. I could stare at those pictures all day! So serene. A place to stay when all of the hustle and bustle gets overwhelming. Love this tour!